While there's little research on whether cannabis effectively relieves pain, many in Maine embrace the drug and advocates say it's a legitimate part of the solution. SHAPLEIGH — Michelle Ham holds up a jar filled with a greenish-black liquid, swirls it around for a few seconds and pours an ounce or so into a small plastic cup. The murky liquid is a tincture of medical marijuana mixed with glycerin, and Ham takes it to control the chronic pain she experiences from two herniated discs in her neck, sciatica and lower back problems. Before switching to medical marijuana, Ham took a daily combination of 29 prescription pills, including several opiates that she says put her in a zombie-like state. She now medicates with the cannabis tincture three times a day. The tincture is made with marijuana donated to her by a caregiver. 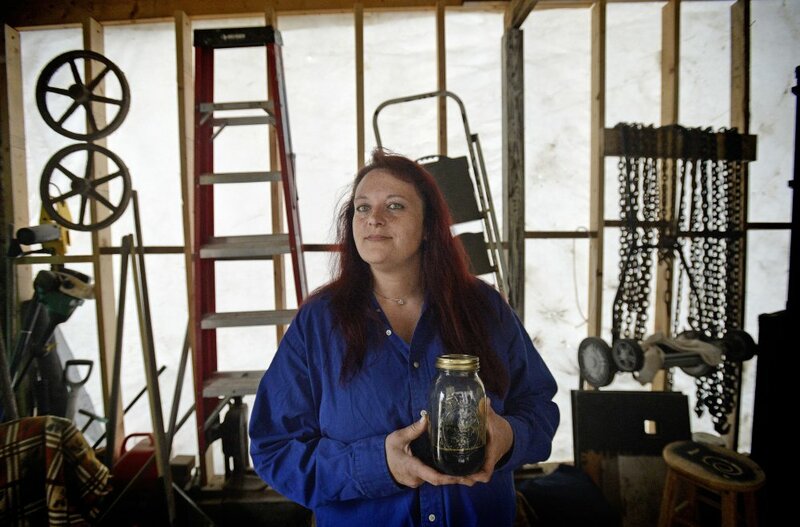 Michelle Ham holds a jar of medical marijuana tincture mixed with glycerin. Soon after swallowing the tincture, Ham says she feels calmer, and the edge has been taken off her pain. To help Mainers like Ham kill their pain, doctors and other health care providers prescribed millions of doses of potent opiate drugs over the past decade. This surge in legal opiates laid the foundation for the explosive increase in heroin addiction, as Mainers who couldn’t get all the legally prescribed pills they needed turned to the illicit street drug, often laced with dangerous additives like fentanyl, to feed their habits and stave off withdrawal symptoms. The heroin epidemic has fed a spike in drug overdoses, which claimed the lives of 272 Mainers last year, up from 208 in 2014 and 155 in 2011. As the state grapples with the impact of the addiction crisis, some Mainers who relied on prescription opiates are turning to medical marijuana as an alternative to treat chronic pain. There’s very little research that shows whether cannabis is effective for pain relief and doctors disagree on whether it should be used for that purpose, but medical marijuana advocates say the majority of Maine’s medical marijuana patients are using it to control pain and avoid the harmful and sometimes deadly side effects of powerful opiates. Ham uses a strain of marijuana called cannabidiol, or CBD, that has little or no psychoactive effect. The cannabidiol strain eliminates the “head high” that can occur in marijuana with strains that have high concentrations of THC, the chemical that causes the euphoric feeling. Advocates and some marijuana patients say that medical marijuana should be considered as part of the solution to the state’s opioid crisis. In 2014, 350,000 Mainers – or about one in four residents – were prescribed 80 million doses of opioid medication, according to the Maine Department of Health and Human Services. But a large body of research shows that opioids do not work for chronic pain and many times are counterproductive because they create a risk of addiction and can lead to other health problems, said Dr. Stephen Hull, director of the Mercy Pain Center and a leading pain expert in Maine. Rep. Diane Russell, D-Portland, who has advocated for broader access to medical marijuana and legalization of the drug for recreational use, said medical marijuana should be strongly considered as a way to fight the opioid crisis. “People are dying. We don’t have time to play morality,” Russell said. Maine first legalized medical marijuana in 1999, then expanded the program in 2010 to create state-licensed dispensaries. Since then, the number of patients has steadily grown as people seek alternatives to pharmaceuticals to deal with issues such as chronic pain, according to patient advocates and dispensary operators. The state cannot provide an exact number of patients because it does not keep a registry, but doctors in 2015 printed more than 35,000 certificates required under state regulations to certify patients. That number could include duplicates and replacement certificates and is likely higher than the actual number of patients, according to DHHS. 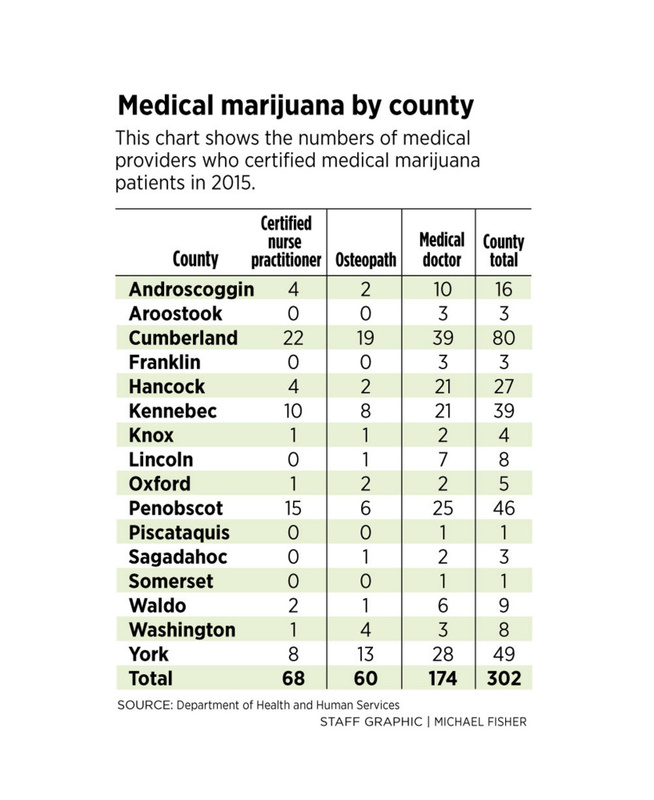 There are about 300 doctors across the state who certified patients in 2015. Health insurance does not cover the cost of medical marijuana or the appointments for patients to get certified if they see a doctor other than their primary care physician. The average cost for certification appointments is around $200, according to medical marijuana advocates. The cost to medicate with marijuana varies widely depending on the form taken, how often it is used and whether it is obtained from a dispensary or caregiver. A tincture could cost as little as $10 a bottle, while marijuana buds could top $300 an ounce. Last year, Mainers spent $23.6 million on medicinal marijuana from dispensaries, a 46 percent increase from 2014. The dispensary sales generated $1.29 million in sales tax. The sales do not include numbers from the state’s 2,225 caregivers, who are authorized to sell marijuana to up to five patients at a time. A first-of-its-kind survey of medical marijuana patients in Maine, Vermont and Massachusetts conducted this month shows that two-thirds of patients surveyed have reduced the use of various medications for pain, particularly opioids. Brian Piper, a visiting professor at Bowdoin College, helped conduct the survey for Wellness Connection, which operates four of the eight licensed dispensaries in Maine. Piper said a third of the patients who use medical marijuana for pain reported significantly reducing their prescription painkillers, while the other third said they had slightly reduced their prescription medication intake. In Maine, two-thirds of the patients surveyed said they had a history of chronic pain, with the most common issue reported as back pain, Piper said. Jon Scott, a patient from the Lewiston area, uses medical marijuana every day to relieve pain in his back and knees, which he injured when he fell off his roof. He said he likes being in control of the doses of his medication so he doesn’t use more than he needs. After giving up opiates, he had to learn which marijuana strains would help him with pain relief, he said. He grows his own plants because he can’t afford to buy marijuana from caregivers or dispensaries, where costs could top $200 an ounce. Each month, he sets aside $16 to save up for his yearly recertification appointment. 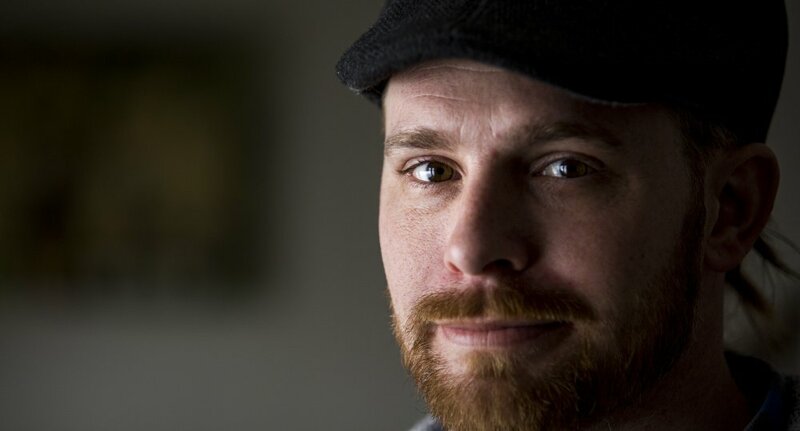 Garrett Guindon, a 34-year-old medical marijuana patient from Saco, uses a cannabis tincture to control chronic pain from knee and foot injuries. After years of taking – and at times abusing – opiates, he says he has found marijuana gives him the pain relief he needs to get through his days working in a nursing home kitchen and attending college classes. He has more energy than he did while using opiates. He says he spends as little as $10 a month on a cannabis tincture from a dispensary in Biddeford. “In my eyes, cannabis is the healthiest medication for me,” he said. Michael Wyllie, a 38-year-old patient from Pittsfield, says he vaporizes marijuana every day to help deal with the pain from injuries he sustained during a serious car accident in 2011. He had been using various opiates after the accident, but said he was constantly nauseated and sweaty and slept most of the day. After starting on medical marijuana, he was able to stop using leg braces. “People couldn’t believe how much better I was as soon as I started on medical marijuana,” he said. Wyllie, who is on Social Security disability, grows several different strains of marijuana to save money. These types of testimonials are personal stories of people’s experiences, and are not the same as a group of patients selected for a research study. In part, that’s because people who do get pain relief are eager to tell their stories, said Dr. Ed Bilsky, vice president of research at the University of New England. “People who try it and it doesn’t work for them, you don’t hear from them very much,” said Bilsky, who agreed with Hull, the pain specialist at Mercy, that more research needs to be conducted. Hull said it’s difficult to determine whether people feel less pain strictly because they are off opioids – which do not work for chronic pain and cause numerous side effects – or whether the medical marijuana has a role in reducing pain. But Dr. Dustin Sulak, a Falmouth doctor who certifies patients to use medical marijuana, said research conducted in other countries and more limited research in the United States suggests that medical marijuana alleviates pain. Hull said the jury is still out, although he did not dismiss the potential of medical marijuana. He said the Mercy Pain Center’s goal is to wean as many people from opioids as possible, by introducing alternative therapies such as physical therapy, exercise, acupuncture and chiropractic. Medical marijuana is not on the list. While chronic-pain patients can qualify for medical marijuana, Russell and others want to expand access to the drug by making opioid addiction a qualifying condition to become a certified marijuana patient. A bill that would have done so stalled in the Legislature this session, and Russell said another effort that would have DHHS add opioid addiction as a qualifying condition is unlikely to be approved by the LePage administration. The health and human services agency will hold a public hearing Tuesday on an administrative request from caregivers and patients to consider adding opiate addiction as a qualifying condition. Russell said that because marijuana doesn’t have a lethal dose – in contrast to opiates – it’s the right thing to do. Sulak, who plans to submit testimony for the DHHS proceeding, said he’s confident research over the next several years will lead to more acceptance of medical marijuana as a treatment for chronic pain. The Obama administration is considering whether to alter federal regulations that classify marijuana as a Schedule I drug, a category that includes much more potent drugs, such as heroin. The classification makes it more difficult to obtain funding and approval for medical research. Reclassifying marijuana as a less dangerous drug should help open the floodgates for research, experts say. There is also a push at the federal level to give military veterans suffering from chronic pain and post-traumatic stress disorder access to medical marijuana. The Senate Appropriations Committee last week passed an amendment that would let Veterans Affairs doctors discuss and recommend cannabis as a treatment option in states where it is legal. Cayford said he feared that becoming a medical marijuana patient would mean he couldn’t get medical care at Veterans Affairs, but so far he hasn’t had any issues. He now vapes a marijuana concentrate a couple of times a day and uses a THC lotion on his knee, but said he never feels a head high that would prevent him from working and going to school. He said he grows his own plants and makes the concentrate, but has purchased medical marijuana from a caregiver in Unity. Sulak, the Falmouth doctor, said he believes there will be more acceptance in the medical community when marijuana can be manufactured into a widely available pill form with controlled dosage levels that can be used for many conditions. He said he has equipment in his office that can test strains of marijuana to determine their chemical potency and help determine dosages for patients, but that’s an extremely inefficient system. “I can’t send them to a pharmacy and say, ‘Get batch No. 3 and know exactly what’s in that formulation,'” Sulak said. He said one interesting study indicates that lower doses of medical marijuana are more effective at controlling pain than higher doses. Sulak welcomes more research on marijuana and pain, although the topic has been studied worldwide, he said, pointing to a recent study in Israel that showed substantial pain reductions for nearly half of 260 patients. Bilsky, the UNE researcher, said he saw intriguing recent research at the University of Michigan that suggests marijuana could be effective in reducing pain. But he said the study needs to be replicated among a larger set of patients. “It may be moderately effective for some types of pain,” Bilsky said. But Bilsky cautioned that some studies link marijuana use with impaired cognition, which would be a concern for adolescents with developing brains. “We want to be careful that we don’t try to address one public health problem by introducing another one,” he said.